For many classroom management relates to the management of behaviour in a classroom and strategies to restore order to and control over a classroom full of unruly or undisciplined pupils. However, this is a very limited and narrow-minded view of classroom management because ultimately, there are many factors that influence what happens in a classroom, not only the behaviour of its learners. The classroom is a place where learning happens and should be encouraged, therefore classroom management relates to the strategies a teacher can use to organise students’ learning. According to Garrett (2015) classroom management can be considered in five categories, of which behavioural management and discipline is only one, the other four categories referring to the layout of a classroom, rules and routines, the relevance of relationships and the importance of instruction. In my view rules and routines and instruction are informed by and in turn impact the relationships between students and teachers, thus there is a certain overlap amongst these four categories. However, what becomes evidence from Garrett’s description of the categories is that for classroom management to be effective a teacher can and should be proactive in organising students’ learning. Disciplinary measures to control behaviour amongst students are only one form of classroom management and the only reactive strategy. Therefore there cannot be a simple solution or one-size-fit all approach to classroom management. Throughout his book Scrivener (2012) demonstrates the complexity of classroom management and which impact small interventions within Garrett’s four proactive categories can have. It is therefore important that a teacher becomes aware of what happens and consequently takes informed and conscious decisions in relation to classroom management strategies. Teachers may or may not have the opportunity to change the physical layout of desks and chairs in their classroom. 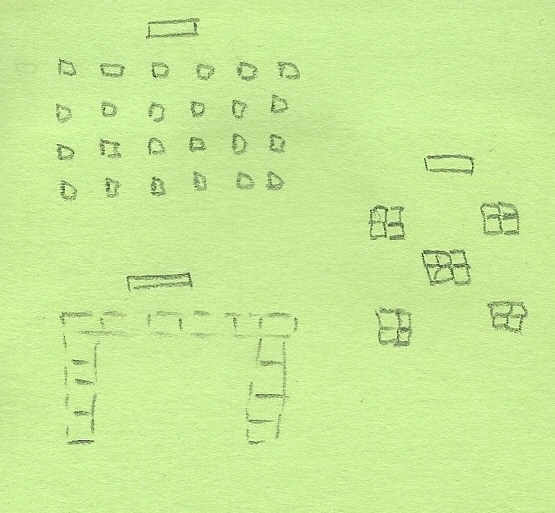 But this is only one aspect of the classroom layout that can be considered. For example, you may want to think about how you decorate the walls and ceilings in your classroom and which displays you are using. Consider the message you are sending out to students if you display perfect essays only or if you have supporting work and key terms explained. Certain rules and routines will have to be implemented as a school-wide approach, but within your own classroom you can introduce your own set of rules and routines. These may refer to how pupils enter and leave the classroom, what they are supposed to at the various stages throughout a lesson, when and how they ask for help and many more. In my MFL classroom I always ensure that students and I greet each other in the target language at the beginning of a lesson. Firstly, I believe in etiquette and even if I have seen some or even all of the students before, I still think it is polite to say good morning to each other. Secondly, greetings are usually an area where pupils feel comfortable with using the foreign language and by having a set routine with greetings the lesson starts on a positive note. And thirdly, using just a few words of French or Spanish or German at the beginning of the lesson means that the students’ minds are being directed to the subject content that will follow and in their minds they make a clear cut from whichever lesson they had before. Again, there is no one best way of managing relationships with students. Ultimately, all teachers need to find their own teaching personalities and must decide which kind of relationship they would like to have with their students because there are benefits and drawbacks to all of them, from authoritarian to laissez-faire approaches. Brookfield (1995) for example demonstrates different views relating to the teacher as a fly on the wall or as at one with the students. I think that relationships work on two levels with some constants and some changeable elements and that it is this approach that makes for a good balance between being approachable and friendly without being students’ friends, which is often a concern teachers have. This category relates to how we as teachers present work and content to our students, how we deliver our learning objectives. To this end, a good lesson plan starting with an exciting hook and strong question and answer sessions are needed, for example. In view of the many theories relating to personalities, personal preferences and learning styles, as well as attention spans teachers should have an array of methods and a range of activities to fall back on, so that lessons are varied and therefore exciting and new for students. It is not possible to have different lessons all the time, but too much of the same teacher-centred approaches will make students passive rather than active agents taking responsibility for their own learning. Many schools implement clear rules and formulate dedicated behavioural management strategies with guidance on how children are to be punished for misbehaviour. In my experience misbehaviour often occurs when aspects of the other four categories have been managed badly or not at all. If learning activities are well-planned and students are clear of what is expected of them then misbehaviour is less likely to happen than when teachers are unsure of the lesson content or contradict themselves. These contradictions may not be conscious, but teachers’ words and actions send out specific messages to pupils and it is there that teachers need to be aware of what they want to convey. Ultimately, we need to remember that good classroom management is proactive and about the students’ learning. If lessons do not go as planned and classroom management becomes more about behavioural management using systematic reflections is a great way to improve practice. Brookfield, S. (1995). Becoming a critically reflective teacher. San Francisco: Jossey-Bass Inc.
Garrett, T. (2015). “Misconceptions and goals of classroom management”. The Education Digest. 80 (5). pp. 45-49. 1 Comment on "Classroom management"
Nice Post. It is a great opportunity for students to learn at a well-managed classroom as it will boost their metal ability to learn in a conducive environment. Visit …..>>>> Classroom Management Techniques <<<…..to learn more.